Laurie Larsen of Normal, right, talks with readers at the Local Authors Fair on Sunday, Nov. 5, 2017, at Bloomington Public Library. For those of us who are too scared to skydive or not rich enough to buy a Corvette, there’s still one thing on life’s bucket list that’s well within reach—writing your own book. It feels more doable than ever, thanks to online self-publishing tools, e-books, and retailers like Amazon. And if you need any inspiration, the Bloomington Public Library is there to help. 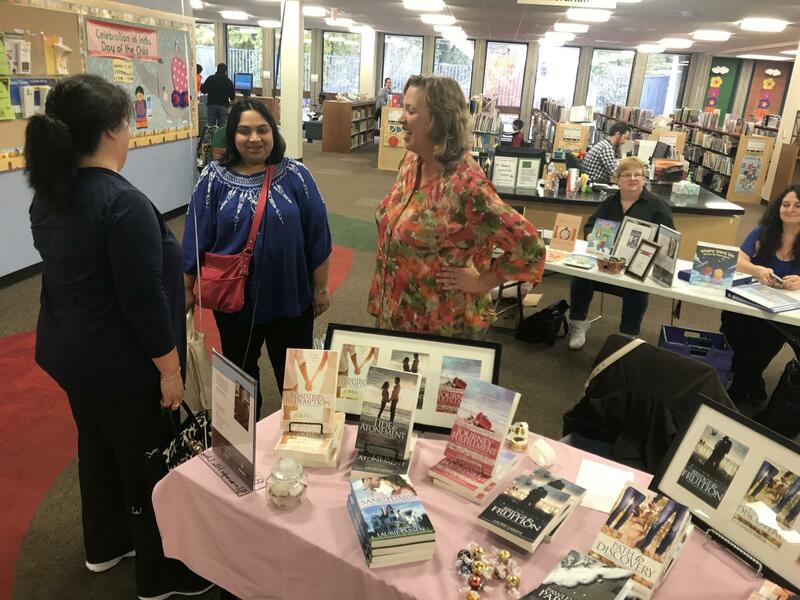 Around 17 writers from Central Illinois were featured at the library’s Local Authors Fair on Sunday. 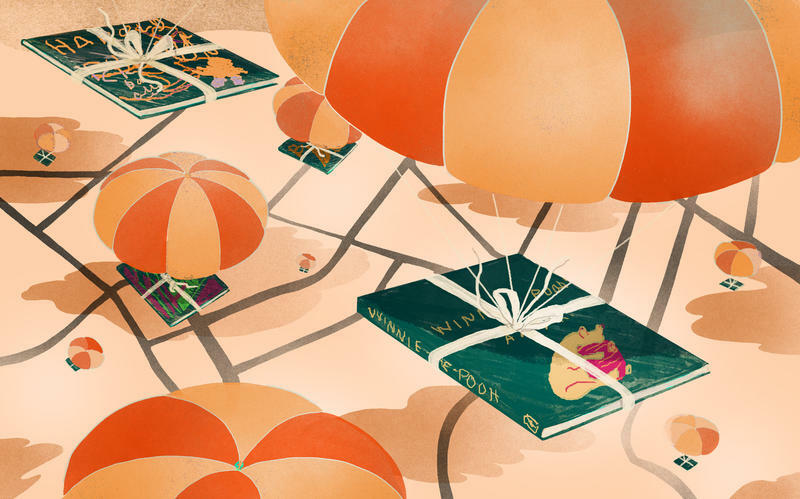 They write in diverse genres, from paranormal romance to sports biographies to children’s literature, and they’ve all found success only after taking the leap and writing their first book. Laurie Larsen of Normal was one of them. She’s written 18 books in 18 years, and now she’s an independent author with own imprint, called Random Moon, meaning she’s basically her own publisher. She writes inspirational romance—love stories with a faith journey. Kevin Wright of Morton talks with readers during the Local Authors Fair. He writes horror, urban fantasy, and mystery books. This second career began in 1999. Larsen had a free weekend while on business trip in Georgia—she still has her day job—so she visited the house where Margaret Mitchell wrote most of “Gone With The Wind.” Larsen became inspired and ran back to the hotel to write. 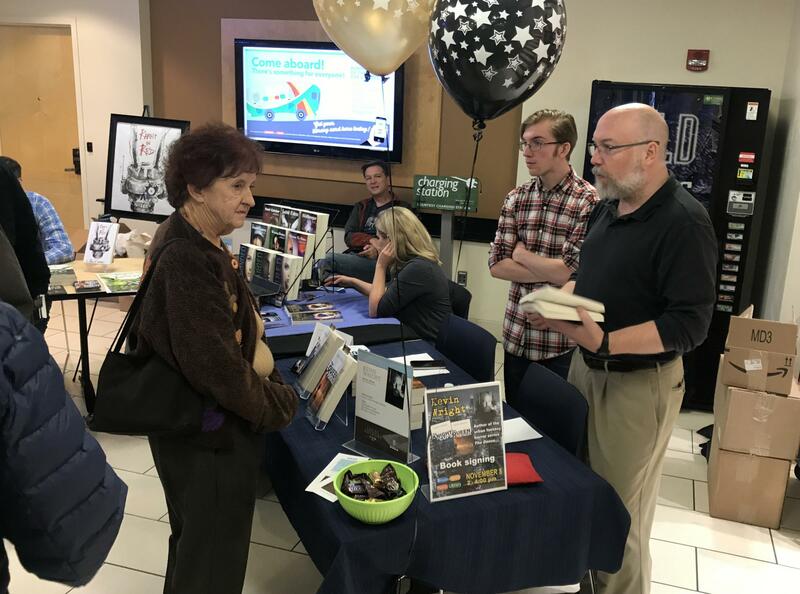 The Local Authors Fair was part of Bloomington Public Library's celebration of National Novel Writing Month. Last November, more than 384,000 people reportedly wrote a novel for "NaNoWriMo." Elissa Daye of Normal, an Illinois State University graduate, writes urban fantasy and paranormal romance, in addition to children’s books under a different pen name. She’s written 20 so far. She wrote her first book after graduating ISU. Her books reference real places—not necessarily by name—in Bloomington-Normal, like Park Hill Cemetery near Miller Park, and the ISU campus. And she can write anywhere. She’ll jot down ideas when she drops off her daughter at gymnastics. And now her daughter, 7, is writing stories herself—trying to be like mom. Andy Zach of Peoria took a different route. Zach wrote stories and plays as a kid but gave it up for years, building a career in IT at Caterpillar. He retired in 2015 and immediately returned to his first love—writing. He’s just published his second book in the “comic paranormal animal” genre, called “My Undead Mother-in-Law.” That genre gives him a way to be funny while also standing out on Amazon. His first book, called “Zombie Turkeys,” was published on Halloween 2016. “That was a wonderful feeling, the very first time you hold your own printed book in your hands and know it’s your baby all the way through,” Zach said. Randy Sharer knows the feeling. He just published his first book, “Virgin Territory,” the story of American distance runner Craig Virgin, who grew up in Lebanon, Illinois. It took eight years to complete the book—a bit of a longer deadline than Sharer is used to as a sports reporter at The Pantagraph. Sharer and Virgin recently self-published the book. 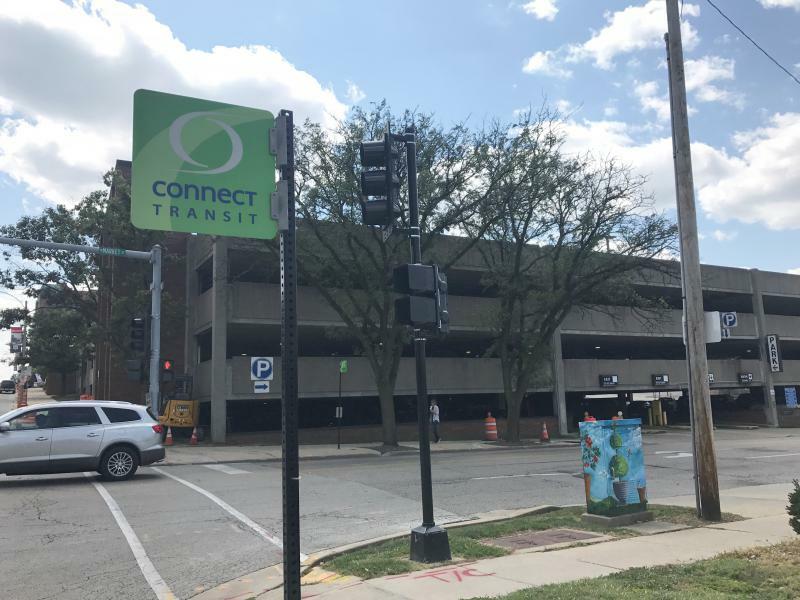 “We just kind of worked on it at a leisurely pace, and it all came together,” he said. Jeanne Hamilton is a month into her new job as the Director of the Bloomington Public Library. Hamilton replaced Georgia Bouda who retired amid concern over a bookmobile program that did not serve the west side of town. Hamilton says it's going well with a great staff. She tells GLT's Charlie Schlenker she is getting to know members of the community. Hamilton says there are no fires to put out, but instead goals to work toward.